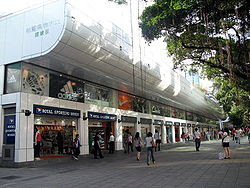 Park Lane Shopper's Boulevard is located on Nathan Road and beside Kowloon Park. It is about 300 metres long of two-storey buildings which gives a sense of strolling along the Champs-Elysees Avenue in Paris. At the end of the Avenue is the Kowloon Park where you can find the largest mosque in Hong Kong which is a place worth visiting. The Park Lane Shopper’s Boulevard consists of a wide range of retail outlets covering fashion, shoes, leather ware, sportswear, cameras, mobile phones…and almost anything you want. Ashley Road, Hankow Road, Lock Road, Haiphong Road. These roads are between Nathan Road and Canton Road, and both of them have many restaurants. Ashley Road has western restaurants and pubs; Hankow Road and Lock Road have Hong Kong and Chinese restaurants; Haiphong Road has local Hong Kong food hawkers. Granville Road is famous for the outlet and cosmetics shops, ladies cannot miss it.